The apartment is spacious 2 story dwelling which has entrance at both ends and has a real comfy home from home feel. At the rear is a courtyard (see pictures) surrounded by 11 other apartments. Some are French owned and it has a real friendly community feel. The front overlooks the heated outdoor pool, grounds and wooded area, beyond which is a small pond which can be used for fishing. The pool is open from mid July to mid September and is maintained by an external company. The grounds are extensive with plenty of room for children to run, play and cycle all within the grounds. The whole complex is extremely tranquil and will guarantee you a very relaxing time when you are not out and about. Pluertuit is the beautiful local village which is 10 minutes walk from the apartment. It has several french restaurants, a creperie, Supermarket, Pattiserie, number of bars and many other local amenities you would expect to find in a small village. The apartment is just 10 mins drive from Dinard which is the closest seaside town and is absolutely lovely. It has a beautiful beach with numerous restaurants and bars. The surrounding area also has dozens of beautiful beaches, coastal walks, sightseeing, shopping, restaurants, bars and other activities. All within easy driving distance. The property will comfortably suit two adults and two small children. There is a double sofa bed down stairs and a fold up single bed can also be used. Within the grounds, there is a small fishing pool surrounded by trees and residents are permitted to fish if they so desire. I do have some basic fishing tackle at the apartment which is more than adequate to catch carp up to 4 pounds. I also have a set of golf clubs which can be used as well. The swimming pool is for residence/guests only and approx 12m by 6m and heated. It is open from 15th June - 15th September only. The courtyard is ideal for Boules whilst enjoying a glass of red which I often do with my friend who owns an apartment overlooking the courtyard. There is a storage cupboard under the stairs which contains the ironing board and vacuum cleaner. We are both professionals in our 40's who live in a small village called Meriden, the very centre of England. We have travelled a lot but have always loved France and wanted to buy a property that was easily accessible and in an ideal place to explore Brittany, both for weekend breaks and main holidays. We use the property a lot, nipping over for many weekend breaks out of season when the area is very quiet. In the summer, we always go for two weeks and meet up with 2 other families. Over the years we have made many friend at the property, especially with the few French residents that live there permanently. We have always enjoyed France immensely - the food, the weather, the countryside, the people, the wine and the beautiful beaches! We currently live in the centre of England and I have always wanted to own a property close to the sea. Buying in Pleurtuit gives us a very easily accessible property in lovely countryside, surrounded by some of the best beaches you will see anywhere. The property backs onto a lovely courtyard surrounded by many of the 11 apartments. The courtyard is used for boule by many of the residents. At the front you not only have direct access to the pool but also to the lovely grounds that lead to a fishing pool which is concealed by trees. In the summer the pool is beautiful and we spend so much time in the garden relaxing, having bar-b-q's and drinking vin rouge. I also visit the small fishing pool daily as I can really relax with a beer down there. There are dozens of places to go and see within easy walking or driving distance and the local food and hostelries are second to none. We can promise you you would not be disappointed with the place ! We love it and go back year after year and are still finding new places to visit! There is a fully tiled main bathroom with a shower and WC. The room is very tidy and well presented. The shower is high pressured and lovely. A beautiful apartment in idyllic surroundings. Upon arrival the apartment was spotless and had everything we needed - it instantly felt like a home away from home. The apartment itself is beautifully finished with a lovely private garden area and great shared pool. We wasted no time jumping in the pool and then getting a BBQ going! A lovely walk into Pleurtuit with some beautiful places to eat. Also a short drive from big supermarket to grab all the essentials. There is so much to do in the surrounding area however far you want to venture in the car - with lots of info left by the owners on their favourite places to go and eat! We loved Dinard (great beach), St Malo and Dinan (beautiful cobbled streets to explore). This is a perfect getaway whether you want to relax, or explore some traditional and picturesque French towns and villages. I have stayed at the apartment several times and have always felt instantly relaxed, at ease and at home. The same can be said again ... instantly falling into a chilling, holiday mode on walking through the door! The apartment is beautifully decorated and equipped for a truly relaxing, very comfortable stay. The owner has made some upgrades and recently installed a new kitchen, redecorated and bought new furniture. It is spotlessly clean and well appointed with everything to a high standard. All you need is provided. The location is superb both the immediate location and the proximity to the towns of Dinan, Dinard and St Malo, all wonderful to visit and spend time in and all very unique! The coastline and beaches are outstanding, and the food whether shopping and eating in or going out goes without saying! 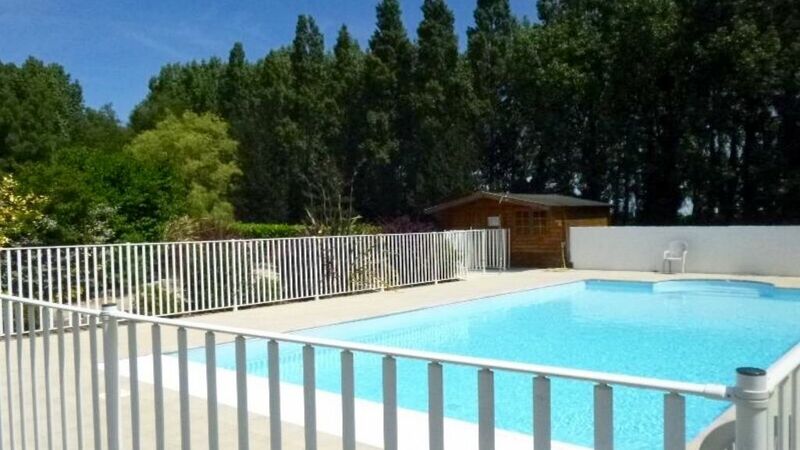 A lovely gite with excellent facilities. The bedroom and living room / kitchen were very well maintained in a lovely peaceful setting but with an excellent heated swimming pool which we used every day. The neighbours were friendly and helpful and the small town was only five minutes away with all the services you could wish. A real bonus was British TV Freeview channels to watch in the evening. The place is close to superb tourist visits like Dinard for the beach and Dinan and St Malo for history and shopping as well as superb food and restaurants. Only a short trip from the ferries to and from UK and close to Dinard airport. If I was in the business of buying my own place in France this would be high on the list. Also excellent communication and assistance from the owner Wayne when needed. Great holiday and many thanks. Spent a lovely relaxing week at this beautiful, clean and very well equipped apartment, every thing we needed was provided and it was like home from home there was even a washing minchine. The town of Pluertuit was a typical French town, there is a supermarket (Super U) for all the big item but in the village there ia a butchers and boulangerie as well as a couple of bars and restaurants. The apartment is ideally situated for sightseeing and St Malo & Dinan are well worth a visit. The owners were very helpfull and were in contact before, during and after our visit to make sure every thing was ok.
Amazing Apartment, village and holiday! The apartment was incredibly clean, tidy and everything we could think of had been provided, including a welcome bottle of wine, which was very much appreciated after the journey! The gite has it's own garden which comes complete with a table and chairs, a BBQ and a chiminea. It was a stones throw away from the heated pool which was the perfect size for both adults and children alike. Our two boys, aged 11 & 8 couldn't wait to get in everyday. The people in the surrounding gites were all very friendly and made us feel very welcome. The village of Pleurtuit is very pretty and only a couple of minutes drive away, or a 10 minute walk. It has an absolutely delicious patisserie from which we bought fresh croissants and baguettes daily. There's also a great, very friendly pizzeria which serves lovely food, and much to our children's delight, non alcoholic cocktails! The surrounding beaches are all within a short drive and are idyllic, in particular St-Jacuit de la mer. I highly recommend this property. We had an absolutely wonderful time and are definitely planning to return next year. After a very short drive from Dinard Airport (15 minutes tops) we came to Pluertuit, a lovely little village with a very friendly feel. It was our first time in France and the Owners couldn't do enough for us in terms of answering our questions and helping us prepare for our holiday. We found the Apartment with ease and was impressed from the start. The Apartments are set out around a very attractive court yard, with this particular apartment's back garden backing onto the swimming pool (which was great for the kids). There is also a small, very pretty lake which we enjoyed walking around daily. The property itself is lovely, immaculate and furnished with very good taste. The new kitchen had everything in terms of appliances. We hired a car and everyday found different beaches to visit (big sandy beaches at Dinard, St Marlo to name but two) and different places to go and eat at night (Dinan was our favourite for restaurants). With so much to see and do our 5 days flew by and we didn't feel as if we had even scratched the surface. All the different places we visited were never more than 20-30 minutes away, which meant we struck a great balance between chilling and enjoying all the apartment has to offer, with getting out and exploring some of the great places on the doorstep. We felt at home from start to finish and loved every minute of our stay. The Owners are top class people, the place is fantastic and it is without hesitation that we are recommending it to our friends and family - we will definitely be looking to return soon! There are literally dozens of interesting things to do nearby. If your interests lie in water sports, walking, cycling, horse riding and golf or simply reading and relaxing and having a good time then this will be a perfect holiday for you. If the weather is poor there is 10 pin bowling, cinemas, go-carting, heated indoor sea water pool and an Aquarium all within 20 mins. Dinard beach (see photos) is just 10 mins by car but there are literally dozens of beaches both large and small and all immaculate within 20 mins. St Enogat, Cast De Guildo are beautiful. All are sandy not stoney or rocky. Many have both shower / toilet facilities and beach side refreshments. Many offer watersports activities too. Dinard airport - 10 mins. St Malo ferry port - 20 mins. Caen ferry port - 100 miles. Calais - 280 miles but the roads and very good and if you stop on the way at Honfleurs (by Le Havre) you will not be disappointed as it is beautiful for lunch by the harbour. Pluertuit - 5 min walk. Dinard - 10 mins in car - 8km and walkable / cyclable along the old flat railway path. St Malo - 20 mins bay car or water taxi from Pluertuit. We are able to provide masses of information on places to go / eat / see and will be very pleased to do so - things you wouldn't necessarily find like the WaterTower restaurant at Ploubalay with stunning views for miles around or the local fish restaurant at Ploubalay which looks like a local pub but is famous with the locals for seafood specialities - stunning. We would require a deposit of 20% in order to secure your booking together with full payment six weeks prior to your departure date. The cleaning costs are in addition to the rates. Guests are asked to leave 50 euros on departure. Changeover Day: Changeover day is preferably Saturday and we will require tenants to vacate the apartment by 10.00am to allow time for the apartment to be cleaned. New arrivals can gain access to the apartment at 4.00pm on the changeover day. We can however be flexible and will be happy to try to accommodate whatever you acquire. Notes on prices We do not charge extra for half terms etc - we are parents and know how frustrating this is. Prices do not include a charge for cleaning. Judith Cottingham my Management Agent will visit the apartment during the early part of your stay to collect a payment of 50 euros from all tenants for the cleaning of the apartment. She will also ensure everything is acceptable and provide you with details of the area, places of interest, beaches and restaurants etc.